Acadian Genealogy Homepage; "Acadian-Cajun Family Trees" CD-ROM! 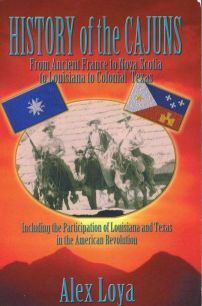 I am very pleased to announce that my SECOND Acadian-Cajun Genealogy CD-ROM is now available! I have made a special arrangement to have Progeny Software Inc., produce and distribute the new CD entitled "Acadian-Cajun Family Trees ©1999", which is Windows-based and include its own Family Explorer&trade; genealogy program authored by Progeny. These combined features make it extremely simple to use! I am now accepting orders for this CD, which contains genealogical information on over 600,000 lineage-linked, family history records of Acadian-Cajun ancestors/descendants and is entirely different from my FIRST "In Search of Our Acadian Roots"©1994 [to current date], CD . This is reportedly the largest single Acadian-Cajun/French-Canadian data base available, anywhere. If your ancestors are here, finding them will be easy using Progeny Family Explorer  the family tree software bundled with the database. Once you've verified a family relationship, you can export records to GEDCOM and import them into your genealogy database program. Data for this CD was submitted by individuals doing family research to Yvon Cyr at the website www.acadian.org. It is a valuable resource for anyone interested in tracing their French ancestry. 1. The easiest (and fastest) way, is to place your order Online using Visa/Master Card. Security is NOT a concern since your order will be processed on a "secure" server. This means that all the information provided is 'encrypted' so that no one can read your actual credit card information! Merely click the link (just under the Visa/Master Card logo below) and enter the required information. If successful, you will be automatically transferred to a "Thank You" page. Within 3-4 working days, you will receive an e-mail message from me, confirming receipt of your order and advising the date the CD will be shipped. It's that simple! If you encounter any difficulty placing your order (very rare), it is usually because the server is "down" for maintenance. Try again in a few minutes. If you still experience difficulty, send me an e-mail and I will follow-up. 3. Click here (or the button just below) to order Genealogy CD-ROM's by Regular Postal Mail. 4. IMPORTANT: The Acadian-Cajun Family Trees was originally only compatible with Windows 95, 98, ME and NT. However, Progeny Genealogy have issued an upgrade for their Family Explorer Program and the CD can now be used with Vista and Windows7. You can download the FREE upgrade from Progeny Genealogy. Thanks for the info on the free download of the Vista compatible program which allows me to play the "Acadian-Cajun Family Trees" CD on the Vista as well as on the XP computer. It took a little doing since the program would not download on my Vista laptop. Each time I clicked on the "download..." prompt, the internet would shut down. I had to download on the XP, then copy to a CD and in turn load the CD to the Vista computer. It was worth the effort; It now works fine on Vista and I am now able to use my original "Acadian-Cajun ...." CD on the Vista laptop. "Anyone researching Acadian names can soon find themselves lost in the myriad of identical names they come across wherever they search. Ie LeBlanc in Acadian research is as common as looking for "Smith". (Some 14000 + on this CD) The first thing you see is a list of names. Entering surname and given, "Charles LeBlanc" filled several pages. I was happy to see I could change the list view from Name and number to name and dates, spouses, or parents. This helped to narrow things down. Then I tried the search function. What a find! I searched on "Place Contains" various towns. While using it, I was surprised to find several hits on my hometown. The results showed deaths as recent as 1994. One of these was for the son of an acquaintance of mine. I was unaware of a son and was very touched. A search on "Notes Contains" revealed some very intersting notes made by some of the reasearchers who contributed the data for the CD. I also had option to display a family group view, ancestors, decendants and print many charts and reports. I have been researching my British roots for some years now, and am looking forward to using this CD to supplement my Acadian research. The information varies from names only for living persons to detailed notes for others. Using this tool, I will be able to better focus my research trips. I wish I had a CD like this when I began my British/Colonial American research!" "The Yvon Cyr CD is a very well packaged and usable resource. Accessing the data on the CD is a trivial task with the many different tools provided with the data. An enormous amount of information is provided; a lot of the individual's entries are duplications within the CD, obviously because of the origins of the data. You must look at every reference however, since each submission Yvon Cyr received was understandably not merged in with the existing data. The next entry might provide that bridge you we're looking to confirm. Or it will extend your tree in a direction you didn't know existed." In some regions of the USA, VISA/Master Card has introduced a recent policy of NOT approving "International" orders unless pre-approved by the customer (this is for your protection). I'm told they also apply this new policy, for anyone who have _not_ used their credit card for a long period of time... again, this is for your protection. So, _before_ placing your order, just phone Visa/Master Card and alert them to the fact that you want this transaction approved. FYI. Click here to see if the surname you are seeking, appears on the CD's. 1. If you want your order shipped to an address different than your home address, please indicate that in the "Comments Section" of the order form. 2. When your order is processed correctly, you are automatically transferred to a "Thank You" page. Your credit card is NOT charged, until you are transferred to this "Thank You Page". Note: If you encounter any difficulty placing your order Online, please contact me via e-mail and let me know so I can follow-up on it. Thanks. PS: I confirm date your order is received by Internet (only) and advise date the CD is shipped-out to you. So please provide your E-Mail address, if applicable. The CD will only run on Windows platform, not native MacIntosh. However, I'm told by a "Mac expert", that you can run it using Windows emulation software, such as Virtual PC. Apparently, it is somewhat slower running because of emulation mode, but it works just fine. Disclaimer: Since all of my CD's are PC-based (and I am NOT a Mac person), I'd be interested to know how well (or even, if) this 'solution' works, from any Mac Users. Q. Family Tree Maker's Web site says it has abandoned efforts to create a Mac version of that genealogy software. What can Mac owners who want to computerize their genealogy do? A. Although Family Tree Maker, now on version 16 for Windows, has long been a stalwart in the genealogy software category, it's just one of the options out there for Macintosh computer users. In fact, there's a whole site dedicated just to Mac roots-and-relatives software at www.macgenealogy.org, and the site also offers news, reviews and user forums. Some of the Mac-based genealogy programs out there include iFamily for Tiger (ifamilyfortiger.com), which integrates itself with the Mac OS X iPhoto program for organizing family pictures. Other options include MacFamilyTree (www.onlymac.de/ indexe.html) and Reunion (leisterpro.com). If you are not sure which software to get, all three programs offer trial versions to download from their sites. The Mac Genealogy site has links to several other Mac-friendly applications and utilities to help you build up your database of personal history. a) I can only accept GEDCOM files. b) I retain the right to use (or not use) your information. c) When you send your file, you release any/all copyrights to me. Be certain to read the excellent "review" prepared by Rick Roberts of Global Genealogy Supply and published in the July 27, 1999 issue if his Global Gazette. "Progeny Publishing, a division of Progeny Software Inc., developers of quality genealogy software and CD-ROM products, today announced the release of a one-of-a- kind Acadian family history resource -- the Acadian-Cajun Family Trees CD. This genealogy CD is being launched this summer in conjunction with the second Congrès Mondial Acadien (CMA) that is being celebrated in Cajun Country, Louisiana, August 1st-15, 1999. Coincidentally, this event corresponds with the Federation of Genealogical Societies Conference, August 12-14, St. Louis, Missouri, where it will also be premiered to the genealogy community for the first time. As with other Progeny CD-ROM products, the Acadian-Cajun Family Trees CD includes the unique Progeny Family Explorer&trade; software that provides powerful search and report capabilities. Using Family Explorer, users are able to quickly search names and print standard genealogy reports, as well as create family tree and fan style charts. A new feature in Family Explorer now makes it possible to export records in GEDCOM format for import directly into any popular genealogy program. "The release of this product at the CMA is auspicious," said Bob Thomas, Partner of Progeny Software, "Particularly since our company is located in the heart of what used to be Acadia, three miles from the point of the Expulsion! Because Family Explorer makes data so accessible, we expect this to be a popular product among all those of Acadian-Cajun descent, even those who are not formally building their own family history database." Yvon Cyr, whose enthusiasm for Acadian genealogy along with his web site (www.acadian.org) got him an interview in Time magazine's recent Roots Mania articles (April 1999), sadly will not be able to attend the CMA this summer due to health problems. "This project was a labor of love for me," says Cyr, "I was devastated to have to cancel my plans to be at the Congrès this summer. I only hope that those attending will connect through my web site, and that way continue to share our Acadian roots." The Acadian-Cajun Family Trees CD operates on Windows 95/98/NT, requires a 486 CPU or better, and 8 MB free hard disk space." Progeny Publishing, a division of Progeny Software Inc., developers of quality genealogy software and CD-ROM products, today announced the release of a one-of-a-kind Acadian family history resource -- the Acadian-Cajun Family Trees CD. This CD is being be launched this summer in conjunction with the second Congrès Mondial Acadien (CMA) that is being celebrated in Cajun Country, Louisiana, August 1st-15, 1999. Coincidentally, this event corresponds with the Federation of Genealogical Societies Conference, August 12-14, St. Louis, Missouri, where it will also be premiered to the genealogy community for the first time. The Acadian-Cajun Family Trees contains over 600,000 lineage-linked, family history records of Acadian descendants. Data was submitted by individuals doing personal genealogy research to Yvon Cyr at the website http://www.acadian.org. As with other Progeny CD-ROM products, the Acadian-Cajun Family Trees CD includes the unique Progeny Family Explorer software that provides powerful search and report capabilities. Using Family Explorer, users are able to quickly search names and print standard genealogy reports, as well as create family tree and fan style charts. A new feature in Family Explorer now makes it possible to export records in GEDCOM format for import directly into any popular genealogy program. Yvon Cyr, whose enthusiasm for Acadian genealogy along with his website ( http://www.acadian.org ) got him an interview in Time magazines recent Roots Mania articles (April 1999), sadly will not be able to attend the CMA this summer due to health problems. "This project was a labor of love for me," says Cyr, "I was devastated to have to cancel my plans to be at the Congrès this summer. I only hope that those attending will connect through my website, and that way continue to share our Acadian roots." The Acadian-Cajun Family Trees CD operates on Windows 95/98/NT, requires a 486 CPU or better, and 8 MB free hard disk space. The "Acadian-Cajun Family Trees" CD-ROM disk contains over 600,000 lineage-linked, family history records of Acadian descendants. Yvon Cyr collected these records at his popular Web site, http://www.acadian.org. Many people contributed their GEDCOM files of Acadian ancestors from Acadia and from Louisiana. Yvon Cyr then combined them into one huge database. 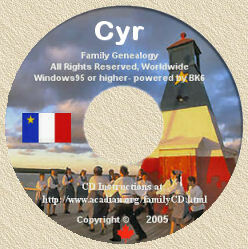 Cyrs database became the foundation for Progeny Softwares "Acadian-Cajun Family Trees" CD-ROM. The CD-ROM contains the names of all the contributors. This CD-ROM is believed to be the largest database of Acadian genealogy anywhere in electronic form. Like any other collection of GEDCOM files, you must treat the information as POSSIBILITES, not as proven fact. Many people contributed the information. Some of these people are genealogy experts while others are probably beginners. You can expect some variations in data accuracy. It isnt practical for Yvon Cyr or for anyone else to go through and verify each and every one of the 600,000+ records contained on this disk. The information is presented "as is" and the user must validate each record presented through independent means. Nonetheless, this is a valuable resource for anyone with Acadian ancestry. Many genealogy CD-ROM disks these days do not have users manuals. I was pleasantly surprised to find a small, 16-page users manual inside the "Acadian-Cajun Family Trees" jewel case. This manual describes the disks contents, tells how to install the software, and even gives information on how to contact the disks compiler, Yvon Cyr. I decided to pick one of my Acadian ancestors at random: Germain Theriault, born in Acadia in 1647. I entered his name into the search program. To my surprise, the software found 25 records for men of that name! Some of these records may be duplicates, but it does point out the French families tendency to use names over and over throughout several generations. I had to click on each record in order to view the details. Luckily, this didnt require much effort. I quickly found the man I was looking for. Not only was his information shown, but the names of his parents and his wife and his children were also shown. To view the details of any of them, all I had to do was double-click on their names. At any time I was able to print family data on paper and also export it as a GEDCOM file. All in all, Id rate the "Acadian-Cajun Family Trees" CD-ROM disk as excellent. Id say this even if it didnt list about a hundred of my ancestors! While all the data needs to be verified, this CD-ROM is a "must have" for anyone researching Acadian ancestry. I know it has earned a permanent place on my bookshelf. I plan to spend a lot of time with it in the next few weeks. For a limited time only, you can order BOTH CD's for a combined all-inclusive price of $59.95 (USA) or $64.95 (Canadian). You can order Online using VISA/MASTER CARD, or via Postal Mail. When your order is placed Online, your Visa or Master card will be charge a total of $59.95 [US funds].